Andover Landscape Design & Construction's firm partner and in-house architect, Russell D. H. Stott, was featured in an article by Erin Marvin at New England Home Magazine. "There are only so many hours in the day, but don’t tell that to landscape designer Russell Stott. As both principal of Andover Landscape Design and Construction and senior manager of Campus Design, Sustainability, and Grounds at Phillips Academy, Stott often says that, 'Phillips Academy is my nine-to-five, and Andover Landscape is my five-to-nine.' A strong love of design, the design process, and fostering relationships with his clients—not to mention a very supportive wife—fuels his daily passion. When he’s not overseeing the 700-acre campus noted for its Frederick Law Olmsted and Charles Platt design, Stott works on a number of custom residential projects across New England. Recent Massachusetts projects include a contemporary rooftop garden in Boston, a backyard pool design in North Reading, master plans for a Federal-style home in Chestnut Hill, and a summer estate in Orleans." Colors and materials take their cues from the home’s architecture, and classic New England materials like granite and bluestone are arranged in clean, contemporary patterns. Along with design elements such as simplicity and asymmetrical balance, his work is also shaped by a solid understanding of how plants mature and what maintenance they require to preserve their design intent. Somehow, Stott also finds time to give back to his community. He currently serves as chairman of the Greater Lawrence Technical School Horticulture Advisory Program, which he hopes will help foster the next great landscape designer." We're excited to share that our Spruce Road Poolscape has been featured in Northshore Home Magazine's Summer 2018 edition -- on newsstands now! You can also view it digitally on pages 88-91. We really enjoyed developing the rear of the property for entertaining family & friends. The wish list included a pool, a generous deck, a hot tub, a lounge area, a sunning deck, and a screened room retreat located within the trees. Pulling off the home’s contemporary architecture, we kept the design linear and simple. An 18 x 36 gunite pool with wedding cake style steps is the visual centerpiece of this back yard sanctuary. Two bluestone terraces are on either side of the pool; one supporting the chaise lounges that face south for optimum tanning while the other is home to the dining area that also provides a transition to the rest of the yard. Large bluestone steppers with lawn joints connect both areas without the heavy feel of a solid walkway. The existing deck was modified which allowed us to sink the hot tub into the frame. This reduced the overall height and kept the sight lines from the home’s interior intact. A vertical cedar screen was built for added privacy and that same material, albeit proportionally smaller, was used to wrap the hot tub for a cohesive look. We're honored to be included in the 2018 BONS Home Awards. Please vote for us under LANDSCAPE ARCHITECT! Voting is open until August 1! "When two empty-nesters decided to trade in their Andover home for a condo in the city, they feared losing precious outdoor space. Those concerns dissipated, however, when the couple bought a gut-renovated townhouse in the South End, complete with an untouched 324-square-foot roof deck off the master bedroom." 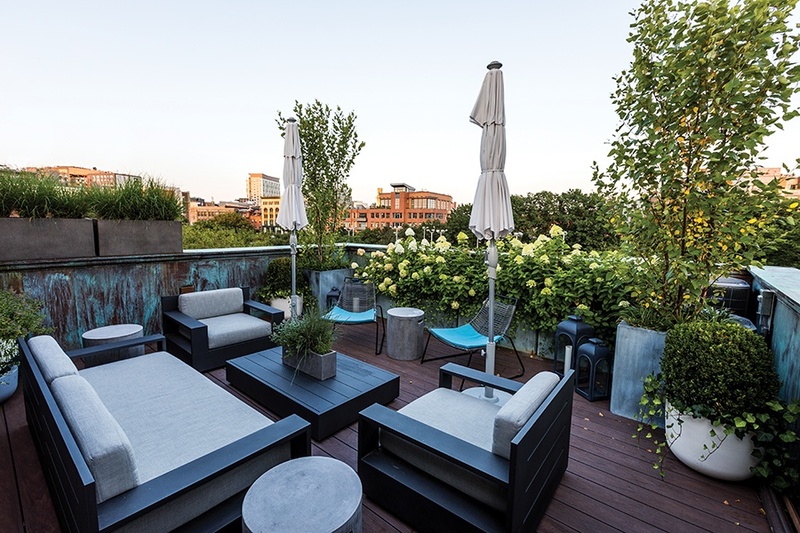 Continue reading about this project under "THE ROOF DECK" in Boston Home Magazine to see how Andover Landscape Design & Construction transformed this space. This was a great project for wonderful clients that we collaborated on with our friends at Les Fleurs. For more information on Andover Landscape Design and Construction, visit andoverlandscape.com. Set up a meeting todayand explore the possibilities! We are excited to share that an Andover Landscape Design and Construction backyard oasis project is featured in the 2018 Spring Edition of Northshore Home Magazine. We truly enjoyed transforming our clients' backyard into an outdoor retreat complete with a pond-like swimming pool and plenty of functional space for entertaining and lounging. View the portfolio from this project on our website. We are also very excited to be a sponsor at this year's Clown Town event. This yearly event organized by Andover's Andona Organization supports the mission to help the youth of Andover learn, grow, and achieve. All event proceeds go back to the children of Andover. Come visit us in our booth on Saturday, May 19th, from 10:00 am until 3:00 pm. Andover Landscape Design and Construction's Russell Stott Named One of New England Home Magazine's "5 Under 40"